Train manufacturer CRRC has unveiled a new model of suburban electric multiple unit (EMU). 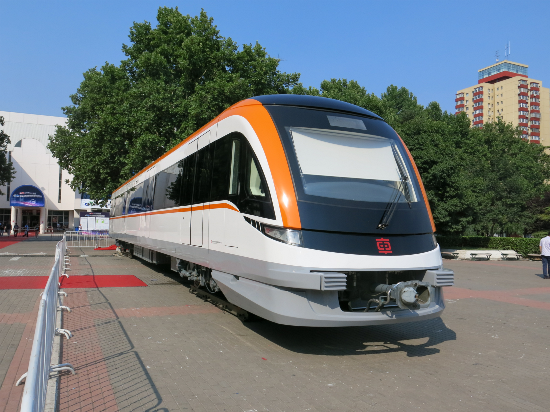 Made by CRRC Qingdao Sifang, the train features rapid acceleration and braking – similar to metro trains – but has more powerful traction equipment which enables it to reach speeds of up to 140km/h. It’s also designed for journeys between 50 to 100km, longer than journeys commonly made on metros. The new EMU has a seating capacity of 2,200 and a dual-system unit which is capable of drawing power at 25 kV 50 Hz and 1·5 kV DC. CRRC said the train forms part of a vision to create a ‘one hour metropolitan area’, where faster trains could serve outer suburbs and satellite cities in an hour from the centre of large cities. The likes of Beijing, Guangzhou, Wuhan and Wenzhou are currently developing these networks. The new design was revealed at the Beijing urban rail transit exhibition UrTran on June 19.